When I found out a couple months ago that The Giver was being made into a movie, I was beside myself with excitement. I’ve explained here before that The Giver is the book that turned me into an insatiable reader. It sparked my imagination in a way that stories about smelly buses and little brothers never did. Without a doubt, it is the reason that I am so drawn to dystopian stories even as an adult. The trailer was released recently and has been receiving a fair amount of negative feedback. Comment sections everywhere blew up with, “How dare they ruin this book! ?” I’m not going to lie. When I watched the trailer the first time, I thought it felt very Hunger Games and Divergent-esque. That’s not at all how I remember the book feeling. But that’s not fair. It’s been almost 20 years since I read The Giver, surely there are things I’ve forgotten. Not to mention, I was 9 when I read it the first time. Being 29 is sure to alter the reading experience just a bit. So I re-read it last night. These are my conclusions. To be fair, this was also my first thought. The scene where the apple “changes” is my most vivid memory of this book even 20 years later. Granted, it’s a 1 minute 30 second trailer for a 2 hour movie. There’s a chance they only included the color scenes. But even if the whole movie is in color, it’s okay. Jonas being able to see color in a black and white world was a device used to show the reader that Jonas was changing. And honestly, it’s a device that really only has an impact when it’s written. When the Giver revealed that the “change” Jonas was experiencing was “the color red,” the reader has a “WTF?” moment. You were DYING to know how the apple changed. It was suspenseful. It was mysterious. And when it was revealed, it blew you away and forced to you look at Jonas’s world in another way. There’s no way this scene is nearly as dramatic on screen because the viewer lives in a world that has red. It doesn’t pull the rug out from under you the way it does when you read it. I’m sure the movie has other tricks up its sleeve to reveal that Jonas is different from the others. Oh, how our child minds remember things. I, too, felt like the trailer was way too heavy for what I remembered. Upon my re-read, I realized The Giver is very dark. There was a lot lost on me the first time around. Citizens take daily pills to suppress sexual feelings. Citizens are assigned spouses and those “units” are assigned children. Professions are assigned. Birth mothers? They’re lower than than low. Citizens get “released” when they’re too old, too sick, or don’t follow the rules. Released, of course, means euthanized. If you don’t remember the scene where Jonas’s father “releases” a newborn because it was an identical twin, maybe you should read it again. Then you’ll realize that the trailer isn’t dark enough. Yeah, it looks like they’re taking some liberties with the source material, and they absolutely should. There’s a reason that the trailer feels too dark for most. It’s because you’re remembering the story from the viewpoint of a 12-year-old boy who didn’t know any better. How did society get there? Who started it? Were there revolts? Does anyone question the status quo? Are the elders really “good?” What’s outside of the society? Has anyone tried to go there? There are so many things that Jonas isn’t privy to. There are so many things Jonas doesn’t even question. But the movie will. I think the movie will show the dark underbelly of “utopia,” and I’m excited for it. Bonus reason… The Dude abides. Jeff Bridges and Meryl Streep, ya’ll. Get hype. I’ve been off my blog game so this isn’t new, but better late than never, right? 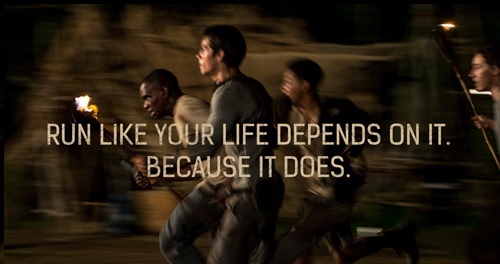 The first official trailer for The Maze Runner was released a couple weeks ago and I’m diggin’ it. As I mentioned in my review of the book trilogy, I really think this is going to be one of those rare cases where the movie is better than the book. Dylan O’Brien as Thomas. Dylan’s acting on Teen Wolf has been ON POINT lately. Like, chills-inducing amazing. He can carry this movie and then some. Thomas Brodie-Sangster as Newt. Thomas currently plays Jojen on Game of Thrones. Needless to say, they don’t cast hacks on Game of Thrones. Better decision making in general. At the 1:10 mark of the trailer below, Teresa shows up conscious and immediately recognizes Thomas–which immediately raises the suspicions of everyone else. This is so much more impactful than the way it’s handled in the book. I’m usually a stickler for source material, but I’m hopeful the movie can fill the gaps the book leaves behind. Maybe I’m turning into a curmudgeon. Maybe it’s my winter blues. Maybe my expectations were way too high and I expected far too much. Whatever the reason, I just could not stay excited about this book. It seemed to me that everyone was raving about this nostalgic and brilliant literary triumph. I couldn’t believe it managed to fly under my radar and I couldn’t wait to get my hands on it. What I actually found was a flat, predictable story that consisted of one deux ex machina after the other. Brief Synopsis: It’s 2044 and the world is in social, environmental and financial shambles. Most of humanity spends its time inside OASIS–a virtual reality simulator that allows each user to be anyone and go anywhere in cyberspace. Before his death, the creator of OASIS, James Halliday (think Steve Jobs type figure), hid an egg somewhere inside the OASIS universe that would reward his fortune and company upon the user who found it first. Wade Watts, aka Parzival, and his fellow gunters (egg hunters) devote their lives to finding the egg. They immerse themselves in the ’80s pop culture and geek trivia that Halliday loved in life, hoping to find clues to aid their search. When Wade becomes the first person to stumble across the first key after years of searching, he enters into a fight to the finish and a fight for his life. Overall impression: By all accounts I should have loved this book. Dystopia? Check. Geek Culture? Check. Child of the ’80s? Check. It was just so painful to read. My two stars are a nod to a concept that I think is brilliant. It had so much potential but fell horribly flat. I wanted to love it, but the writer in me cringed on almost every page. When I read the premise for this story, I thought the ’80s nostalgia would be woven masterfully throughout like a golden thread holding everything together. Turns out the nostalgia is crudely dumped anywhere it will fit just for the hell of it. WARNING: There is a high potential for spoilers beyond this point. This part of the review is generally for people who have already read the book and are looking for someone who agreed or disagreed with their own opinion. The characters are as flat and bland as cardboard. We’re inside Wade’s head and yet I get no sense of him as a person. His aunt is murdered and he keeps it moving. Yeah, it wasn’t the best relationship, but he feels/thinks nothing about it? He’s in love with Art3mis and we only know it because he tells us over and over and over and over and over. Speaking of “over and over,” there’s far too much telling, not enough showing. The story jumps from one info dump to the next with zero regard for character or plot development. At one point, there are at least 3 pages dedicated to Wade’s morning routine. And another 3 pages dedicated to how he uses his computer… right down to adjusting the brightness and contrast of the screen. Not joking. As mentioned above, name dropping for the sake of name dropping. A Lord of the Rings reference here. Some Star Trek there. Sprinkle it with some Cyndi Lauper. Publish. My new favorite word: deux ex machina. I knew a word had to exist for this phenomenon and I’m so glad I found it. Deux ex machina: whereby a seemingly unsolvable problem is suddenly and abruptly resolved by the contrived and unexpected intervention of some new event, character, ability or object. Of everything I took issue with in the story, this is the one that drove me up a wall. Did I mention that Wade is a 007 level secret agent who also happens to be a master hacker? That’s because HE’S NOT. He’s a high school kid who has lived almost his entire life in a trailer, never leaving his hometown. Yet SOMEHOW, he’s able to hack government files, create new identities for himself, infiltrate the enemy, hack the enemy’s internal files, steal what he needs to win the game, and make it back out again without EVER GETTING CAUGHT. He and his three “best friends” are in grave danger of getting murdered in real life by the enemy? NO PROBLEM! The OASIS co-founder just so happens to regularly hang out INVISIBLY in their PRIVATE chatroom. You kids have gumption. I’m sending my private jets to pick all of you up right now. You’ll be safe at my mansion. There are many many more instances like this, but I’m going to leave it at that. Scribd, the world’s largest online library and (basically) Netflix for books, just revealed the most popular ebooks for each of the 50 states. The list was calculated by determining how many times a book was read by readers registered in that state. I love looking at information like this! Here’s the full list that I stole from Parade. What are your thoughts on the list/your state? I feel like I’ve been all Game of Thrones all the time around here lately. But, since my Dance with Dragons hangover hasn’t fully subsided yet and the next season is so close , I suppose that’s to be expected. To fill the dragon shaped hole in my life, I dove into the Tales of Dunk and Egg. They are the first three in a series of novellas that take place in the ASOIAF universe approximately 90 years before the events of Game of Thrones. The stories follow the adventures of Sir Duncan the Tall, aka Dunk, and his squire, Aegon V Targaryen, aka Egg. In a word, these novellas were FUN. I often joke that I know more about Westerosi history than I do American history, but it’s probably true. I study the ASOIAF genealogies, particularly Targaryen, to the point of obsession, so these were kind of like mini history lessons for our favorite dragon wielding family. Remember in Clash of Kings, Maester Aemon explains to Jon Snow that he was offered the throne after his two eldest brothers died–Daeron from the pox and Aerion from drinking dragonfire while in exile. Aemon refused and took the black, leaving Aegon V to rule. That’s Egg! Aegon the Unlikely. In Storm of Swords, Jaime reads the White Book to learn more about Ser Barriston Selmy. We learn the Dunk is listed among the notable Commanders of the Kingsgaurd. Of course he’d be the Lord Commander of his bestie’s Kingsgaurd! We also learn that it was Egg who knighted Ser Barriston. Most recently, in A Dance with Dragons, Ser Barriston explains that Egg married for love and allowed his children to do so as well, leading to much resentment among the the high lords of the realm. We don’t know who Egg married yet… that piece is conveniently missing from the Targaryen family tree… but I have theories about that. A story for another day. Maybe my geek is showing by nerding out over little details like this, but it’s one of the things that I love so much about Martin’s work. Everything is dynamic. The pieces are all moving and fit together perfectly. Even without looking for the connections, it’s fun to read light and easy stories that take place in the universe we’ve all come to know and love. If you can’t get enough of this story or this universe, I highly recommend these novellas. In the first novella, we see how Dunk and Egg begin their friendship at the Tourney at Ashford. We meet several Targaryen notables, including Prince Baelor, Prince Maekar, Prince Daeron, and Prince Aerion. Most importantly, we learn why Aerion is sent into exile… and it has everything to do with Dunk. The second novella gives us a closer look at the Blackfyre Rebellion through the recounting of Ser Eustace Osgrey to whom Dunk is sworn. We get to understand the conflict from both sides– Ser Eustace’s as a rebel and Egg’s as a Targaryen. Over the course of the story, Dunk and Egg manage to mend the rift between House Osgrey and House Webber. Dunk even gets a little love from the ladies. Dunk and Egg make their way to a wedding tourney that puts them in the wrong place and the way wrong time. This novella digs further into aftermath of the Blackfyre Rebellion. Most notably, we meet the Hand of the King, Brynden Rivers, aka Bloodraven. This is really exciting if you believe, as I do, that Bloodraven is Bran’s three eyed crow. Directly translates to… March is going to be SUCH A LONG MONTH. Or “all men must die.” One or the other. Good Guy HBO is doing everything it can to fill the Game of Thrones shaped hole in all of our hearts. They’ve released three more teasers for the upcoming 4th season. They’re pretty exciting… even if they also serve to remind us how far away April is. As I’ve mentioned before, I’m a sucker for good marketing and advertising, and HBO has always done a fantastic job when it comes to getting people extra excited about Game of Thrones. Remember the dragon shadows for Season 3? Now, HBO has commissioned 3D street art of The Wall in London and it’s AMAZING. The artwork is intended to promote the release of Season 3 on DVD and Blu-ray, but it’s also just in time for Season 4 so it’s a win, win, win.